When polyethylene is exposed outdoors, the ultra-violet component of the sunlight causes photo-oxidation of the polymer, resulting in surface crazing and a marked deterioration of the mechanical properties with time. The standard for UV performance for PE Water Tanks specified in AS/NZS 4766 is 8,000 hours of uninterrupted exposure to an intense and specifically developed UV light source. Qenos incorporates stabilisers into its rotational moulding resins to provide exceptional weather resistance for outdoor applications. 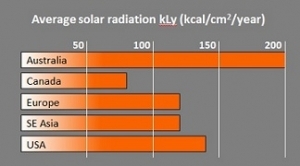 The long term UV performance of the resin is then exhaustively tested under conditions of controlled irradiance, chamber temperature and humidity, and repeated rain cycles. Alkatuff LL711UV resin achieves a class leading UV performance exceeding 20,000 hours against the required standards, enabling tanks made from Alkatuff LL711UV to be Tough in the Sun. Who makes Alkatuff? Do they also make tanks?